Best Ping Monitoring Software & Tools for Managing & Monitoring Up-time for Servers & Network Devices! Ping Monitoring is a common practice used to check the availability and status of network devices and computers using ICMP protocol. With this method of monitoring, a special network packet is sent to the target device, to check if the device responds back with the same packet and the amount of time it takes to respond. Below you’ll find a List of the Top Tools you can use to monitor your Servers and network Devices and a quick Review of How they work and their Features. 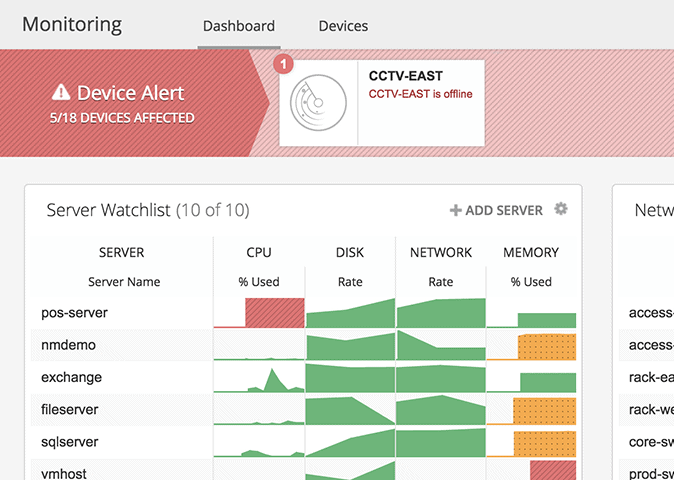 Ping monitoring helps you know if a device is online and is in an Active Mode. If the device doesn’t respond to your ping, it simply means the device is not functioning or is Potentially Offline. Also, ping tools check if the device is sending your request back within a reasonable amount of time and measures latency in your network. Again, there is a problem with your device if it takes too much time to respond. 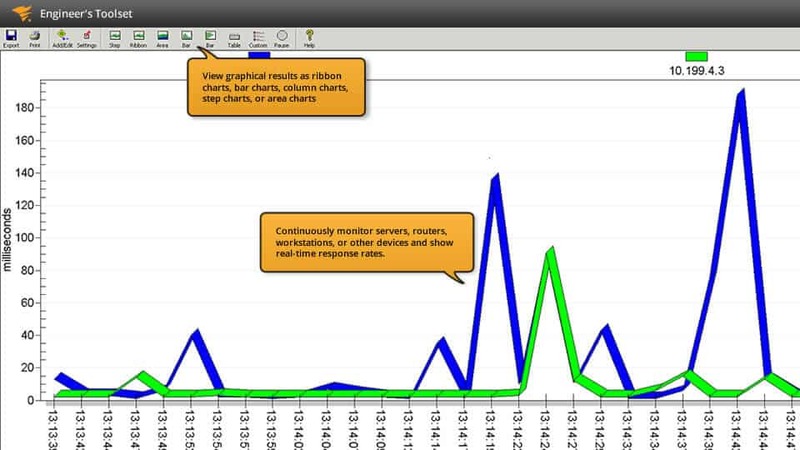 Ping monitoring software takes a lot of burden off the shoulders of network and IT administrators. They need not manually ping every device in the network to ensure that they are available and working all the time. Here are some of the best ping monitoring tools for monitoring the health and availability of servers – Some are Free and Some are Paid Enterprise Solutions that are scalable to massive Infrastructures – We suggest downloading the ones that you feel suit your needs and give you most well rounded feature sets for your individual environment. 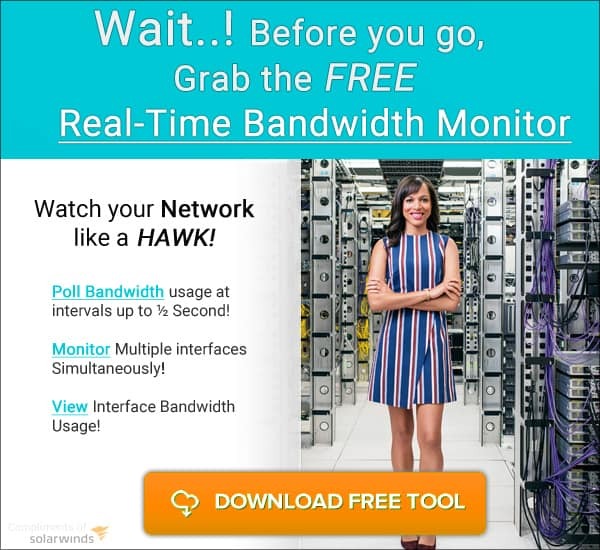 The Engineers Toolset from SolarWinds is a tool that monitors devices continuously to report any problems right away using a easy to read and Use graphical Interface. 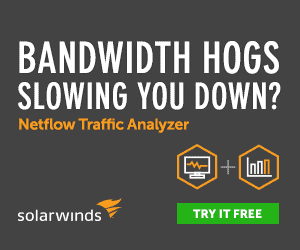 Spotting downtime in your network infrastructure has never Been easier! You can select the devices you want to ping. The data collected by this tool can be exported as text files. Any images or reports can be exported as image files. This tool displays the collected data in the form of graph, ribbon, area or line charts, depending on your preference. You can create a custom profile to monitor the devices in that list. Automatically discovers devices and even maps the network topology for you. It tracks not just availability, but also other aspects such as performance and latency. Comes with packet route tracing options to help you be in complete control over the performance of your device. This tool starts at $1,495. 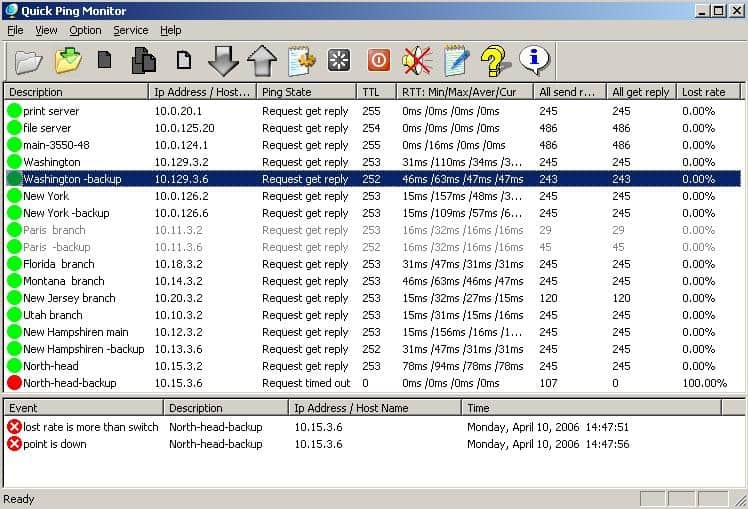 PRTG Ping Monitoring Software is a is a Windows-based monitoring tool that allow you to monitor the entire network through ping. In PRTG, the ping sensor is a central sensor. During the setup process, a list of IP addresses are pinged and the initial monitoring is configured. If the ping fails on any device, you’ll get notification right away. 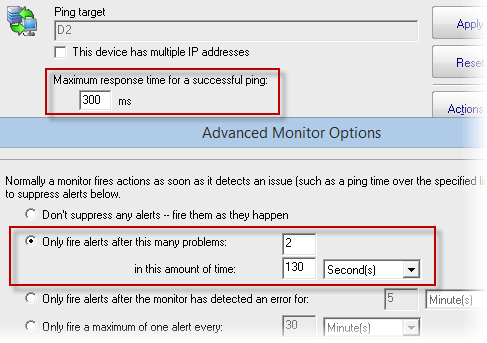 Ping monitoring can be used to check the availability of all network devices. Notifications can be customized to meet your needs. An intuitive dashboard makes it easy for you to get a quick overview of the status of different devices. The setup and use is simple and user-friendly. It works well on different devices such as routers, switches, servers, PCs and more. Gives information about not just availability, but also other aspects such as downtime, uptime and connectivity. To get a more detailed look, you can include other sensors too such as SNMP, NetFlow and Packet Sniffing. The ping sensor is setup as the master sensor for your network devices. If this sensor fails, all the other sensors on your device switch to sleep mode. This means, your notifications will be crisp and prompt. It uses the Auto Discovery feature to ping your private IP addresses and to automatically create sensors for your network devices. Comes with a transparent licensing model. PING sensor – This is one of the most commonly used sensor and it displays the minimum and maximum ping time of a series of pings and information about packet losses. PING JITTER sensor – This sensor sends a bunch of ICMP requests to calculate the jitter. In general, a jitter shows the average deviation of latency to give you an idea of the quality of your service. CLOUD PING sensor – This sensor measures the ping time of your network from different locations in the world. This can be an important tool for companies that have an international presence. The pricing of this product depends on the number of sensors and installations. There are also two other plans that allow you to install unlimited sensors. The first plan called XL1 gives you the option to install any number of sensors in one core installation, and costs $14500. The second plan called XL5 allows you to install any number of sensors on five core installations and the cost of this is $60000. All these plans include a one-year maintenance. To renew, you have to pay 25% of the original license price. Nagios offers a complete ping monitoring tool that monitors not just the health and availability, but also monitors reachability and packet loss. Helps you stay on top of the availability of different devices including your servers. You can determine the threshold level to get notifications. Sends different alert messages such as warning and critical, depending on the seriousness of the issue. Information about packet loss is available. This is important to ensure that your network is not compromised and the packet is returned to the sender safely. Any protocol failures or network outages can also be identified at the earliest. Fairly simple to use and comes as a part of the powerful Nagios XI monitoring tool. You need to install a ping plug-in for monitoring. The most common Nagios plug-in is “check_ping” and it is used to monitor the ping output of a remote server. You can find this plug-in under “usr/local/Nagios/libexec” directory, if you’ve installed Nagios directly from the source. -H stands for hostname or IP address of the remote server you want to ping. -t is to change the connection timeout. By default, this value is 10 seconds. Contact the sales team at https://www.nagios.com/products/nagios-xi/buy/ to know more about pricing. 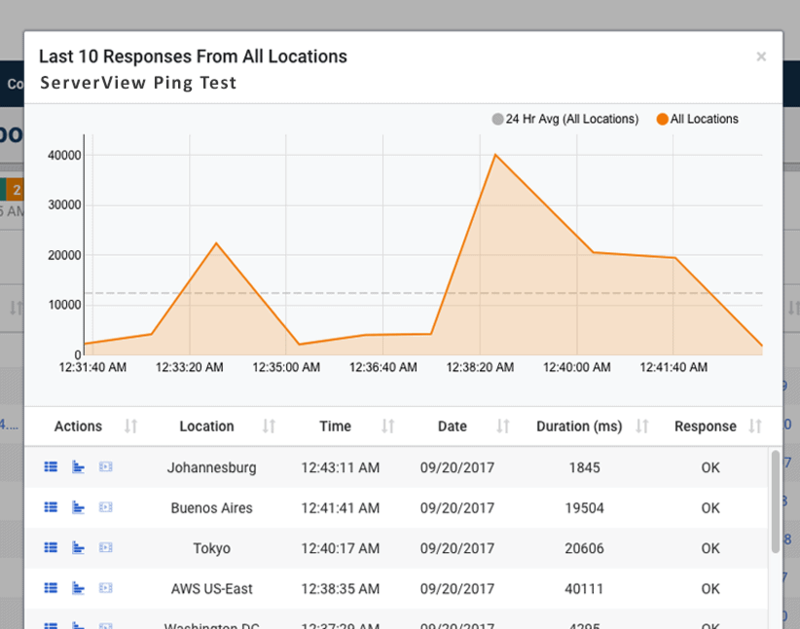 Spiceworks ping monitoring tool helps you stay on top of the performance and availability of different devices within your network. Below is a list of its features. Works well on IP-enabled cameras, VoIP devices, x-rays, scales, access control systems, websites, servers, routers and more. Setting up is easy. All that you have to do is add the IP address or hostname of your critical device and it gets automatically setup on your dashboard. Smart alerts help you to know if any of these devices are down or if there is any delay in response. You can set the timeout thresholds for every device. 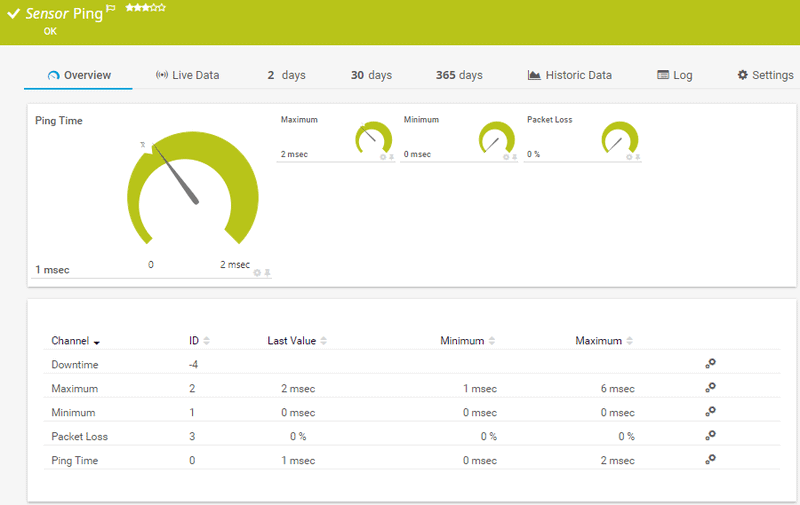 The dashboard is comprehensive and gives a quick overview at any time. 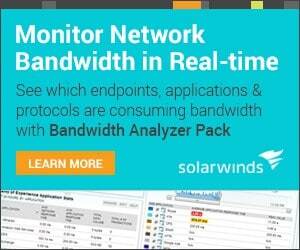 Spiceworks ping monitoring tool is free and even comes with support. 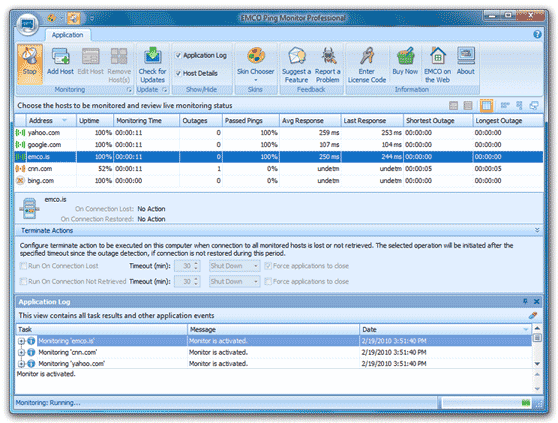 EMCO Ping monitor is a robust monitoring tool that automatically checks for connection to network hosts and devices. Here is a list of its features. Besides connection information, it also provides other details such as uptime, outages, failed pings, etc. This gives you complete control over your devices. You can extend the functionality of this tool by executing custom commands. Alternately, you can choose to launch applications when the connection is restored. It works 24/7 to track the connection status from one or multiple hosts. It alerts you through Windows tray balloons, email notifications and even by playing sounds. It generates reports. You can choose a HTML or PDF format, and can even set it up to email this report to you. It sends ICMP ping echo requests and analyzes the replies to give you a complete idea. It saves and aggregates data about every ping, so you can get details about the average ping times and the deviations, if any. The information collected by this tool can be converted into visually-appealing charts and reports at any time. You can choose from a wide selection of templates for your report. Professional Edition – This edition allows you to monitor up to 250 hosts. Every host can have custom configuration and it runs as a Windows service, which means, the monitoring will continue even if you log off. Enterprise Edition – This edition puts no limits on the number of monitored hosts. It includes all the available features and works in a client/server model. The server is a Windows service while the client is a Windows program that connects to the serve through a UI. This way, multiple clients can be connected to the same server. The free edition does not cost any money. The professional edition has the following prices. The enterprise edition comes with the following pricing. MetaPing is a visual tool that allows you to know the health and availability of your network devices. It is a small and quick tool that runs on Windows. You can see the availability and network latency at any time. Historical data can be represented in the form of visually-appealing charts and graphs. You can see the complete details of any host on your dashboard. Since it is a small utility tool, it doesn’t need much memory or CPU processing resources. 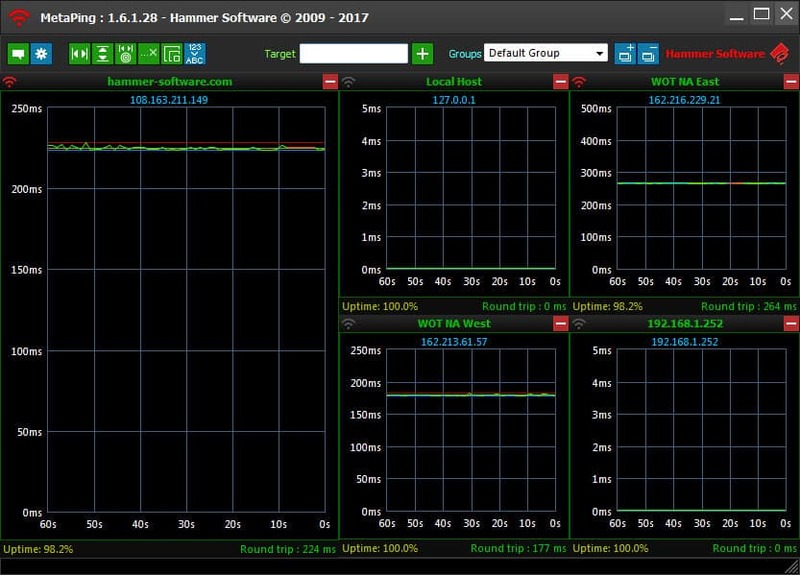 This ping monitoring tool from Hammer Software is free. PingInfoView from NirSoft is a small utility tool that allows you to ping multiple hosts to check their status. The features of this useful utility tool are as follows. You can watch the status of many hosts in one single table. It accepts both hostname or IP addresses to ping. As a user, you can specify the number of seconds and the tool will automatically ping all devices once every x seconds you specify. The simple table displays the failed and successful pings as well as the average time taken for response, so you can see it all in one place. You have the option to save the results in a text, html or xml file. Alternately, you can also copy it to the clipboard. Requires no installation or .dll files. To use this tool, just run the executable file (PingInfoView.exe), type the hostnames or IP addresses you want to monitor and click “ok”. Supports more than 20 languages such as Arabic, Valencian, Russian and more. This tool runs well only in the following versions of Windows. It does not work in any of the older versions of Windows. There is a specific format and a set of options you need to know to use this tool. You should specify the IP address in the below format. If you add a “#” character before a host name, this tool will ignore that IP address. /stext <filename> – Makes a single ping and saves the results in a text file. /stab <filename> – Makes a single ping and saves the results in tab delimited text file. /scomma <filename> – Makes a single ping and saves the results in a CSV file. /stabular <filename> – Makes a single ping and saves the results in a tabular text file. /shtml <filename> – Makes a single ping and saves the results in a html file. /sverhtml <filename> – Makes a single ping and saves the results in a vertical html file. /sxml <filename> – Makes a single ping and saves the results in a xml file. /PingEvery <0 or 1> – Specifies whether the tool should ping every x seconds. here, 0 stands for no and 1 stands for yes. This ping tool from Dotcom-monitor is an easy way to ping and verify the connectivity and status of many different devices in your network. Uses ICMP ping requests to verify the status of any device on the network. Sends alerts about issues, as soon as any monitoring goes below the established threshold limits. Reports are in simple format and designed in such a way that anyone can understand, regardless of their level of IT knowledge. It can give information about UDP server availability by sending packets to specified ports and waiting for a response from them. The Power Admin comes with a simple interface and powerful pinging capabilities that hides the complexity from the user. Allows to set simple ping alert threshold values, so you can alerts when the value goes below the threshold limits. When the host doesn’t respond within a given time, the configured actions are fired. You can set these actions. Complete flexibility, as you can determine the response time, targets, threshold values and just about everything else. It can ping multiple IP addresses. The results are available in a clean and simple to read format. Many different reporting templates are available to meet your needs. Contact the sales team at https://www.poweradmin.com/contact-us/ for pricing. TallSoft is a powerful graphical IP monitoring tool that monitors the state of multiple IP equipments simultaneously and gives the results of their availability. Constantly monitors the state of routers, switches, network devices and more. Sends alerts through emails, messages and sounds. Notifications are sent within seconds of detecting a delay, so you can take corrective action right away. Monitors network lines and servers, so any break can be easily identified. This is particularly useful for large companies that have many network lines. It can monitor one block of IP addresses (65536 continuous IP addresses) at a time. This information can be displayed in visually appealing graphs for easy readability. There are four colors for different states. Green indicates normal, yellow indicates unknown state, red and yellow in the case of a high package lost rate and red in the event of a breakdown. You can set the length of a ping packet. It watches several parameters such as IP address, uptime, downtime, average response time, package lost rate and more. It can send email to 256 administrators at the same time, notifying them of a problem. This quick ping monitor tool is priced at $29.95. In short, ping monitoring tools are a great way to know about the availability, status and performance of each and every device on your network. The above list includes some of the best tools available in the market today, and they can sure take a lot of workload from your employees.